Historians have long concurred in identifying professional authors as the occupational group most prone to habitual tobacco use. 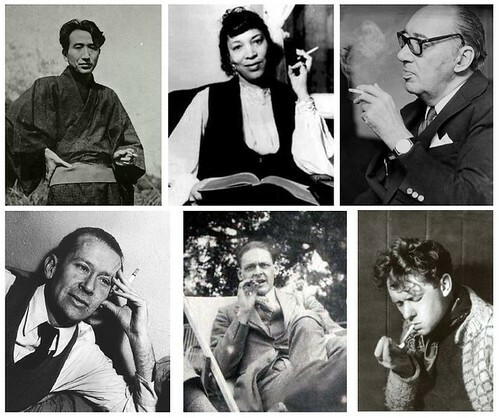 Writers are most closely associated with the practice of smoking in particular, as if, in the general consensus, the scribe could find inspiration in a tobacco pouch or pry the muse from her hiding-places with a few puffs of poisonous fumes. Other stimulants have found favor among the authorial class; a special example being coffee—Voltaire and Balzac were known to have downed prodigious quantities on a daily basis—but no substance, except for printer’s ink, has been seen to play so important and intimate a role in the life of the workaday wordsmith. History has preserved only the slimmest visual record of other fads and fashions of tobacco-taking, such as snuff-inhalation and wad-chewing, perhaps because of the unattractiveness and perceived vulgarity of the sniffing and spitting attending these methods of ingestion, although posterity has left many prized examples of sterling silver snuff boxes and gleaming brass cuspidors. Archives abound, on the other hand, with groaning files of photographs of this or that celebrated author taking a deep, satisfying drag from pipe, cigar, or cigarette. But then there is the sad story of Austrian poet Ingeborg Bachmann (1926-1973): definitive proof against the advisability of smoking in bed. Bachmann met her tragic demise when she fell asleep with a lit cigarette in hand. She may have had the same doctor as Erik Satie, whose advice to patients was: By all means smoke; for, if you do not smoke, someone else will smoke in your place! Perhaps it is no accident that smoking was introduced to European explorers by native American shamans who used “sacred smoke” as a conduit to visionary experience and spiritual guidance. Legend has it that the American Indian system of inter-tribal communication known as “smoke signals” had its origins in the aerial pictograms formed by figural swirls of tobacco vapor seen during communal pipe-smoking sessions. Certainly, anyone who has ever witnessed smoke balls curling into the air from the tip of a cigarette can attest that, at times, the ghostly patterns made by their fleeting, caliginous coils appear to form letters, even words. Late one recent evening I pulled a pack of cigarettes from my pocket. I did this almost without wanting to. I never gave much thought to how many cigarettes I had on hand, or to when I was going to smoke them. It was a long time before I began to think about the spirit of such interactions: of the spirit of man in relation to his fellows; of the spirit of man in relation to things; and certainly I never thought about the spirit of things in relation to men. But without wanting to, I was staring fixedly at a thing: the pack of cigarettes. And now as I analyze it, I recall it vividly. I remember that I had fully intended to pull out one of the cigarettes, but only barely touched it with my finger. Then I began to pull out another, but couldn’t get hold of it firmly, so I pulled out a third. I was distracted all the while—somehow they were able to dominate me a little—yes, it was plainly evident that, along with their scanty material substance, operated a corresponding spirit. And this infinitesimal, discretionary spirit enabled them to orchestrate the escape of some, while I reached for others, instead. The other night I was walking with a friend. Then I became distracted, began to sense something odd, and started thinking about cigarettes. I had the urge to smoke and when I reached for one of them, suddenly I changed my mind and reached for one of the others. Without meaning to, I crimped the tip of the first one I touched, and it seemed as if it had caused me to do this so as to avoid being taken. 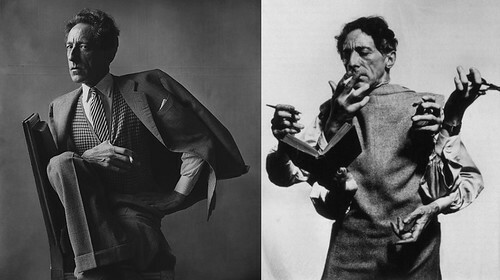 If given a choice, my tendency has always been, as is only normal, to prefer my cigarettes unbent. Consequently, I pushed the broken cigarette to one side, away from the rest. I offered them to my friend. He reflexively chose the one snuggling in the corner by itself, because it was easiest to reach but, when he saw that it was crooked, he immediately reached for another. I was preoccupied by this series of events for quite awhile but, as we resumed our conversation, I gradually forgot about it. A few hours later, I again felt the craving for a smoke; I pulled out the pack of cigarettes and then it struck me. With much surprise I saw that the twisted cigarette wasn’t there, and I thought I must have smoked it without noticing, and my obsession vanished in a puff. Still later the same night, when I picked up the pack once again, I was confronted by the following: the broken cigarette hadn’t been smoked after all; it had fallen sideways and was lying horizontally at the bottom of the pack. Certain now that it had deliberately eluded me several times, my obsession returned with redoubled tenacity. I was seized by an overwhelming curiosity to see what would happen if I smoked it. I stepped out to the patio, removed all the cigarettes from the pack except the wrinkled one, re-entered the living room, and offered it to my friend; since it was the only one left in the pack, he would have no choice but to take ‘it’. He started to take it, but then refrained. He regarded me with a smile. I asked him, “Is something wrong?” He answered, “Yes, but I’m not going to tell you what…” This really frosted me, but then he added, “There’s only one left and I’m not going to be the one to smoke it.” Then he pulled out his own cigarettes, and we smoked two of them in silence. A Uruguayan writer of growing reputation, Felisberto Hernández was born in Montevideo, and spent most of his life in its environs. Early in his adult life he supported himself as an itinerant pianist, traveling throughout Uruguay, Argentina, and Brazil playing in silent movie theaters and giving private recitals in wealthy homes where, it is presumed, he met an abundant supply of ample-bosomed, matronly women which gave rise to the rumor, whether baseless or deserved, that he had an amorous obsession with corpulent women, and enjoyed a succession of dalliances with them. Certainly there is evidence that, as Hernández advanced in years, each of his numerous wives and female companions seemed better nourished and more graciously endowed with adipose tissue than the last. A composer as well as a pianist, Hernández gave concerts featuring both his own works and those of such contemporaries as Igor Stravinsky. Hernández’s fast, agile fingers enabled him to ply two trades—that of musician and that of stenographer. He developed a stenographic system of his own which was highly innovative and efficient and he even wrote stories using it which were found, unpublished, at the time of his death—but no one has been able to decipher them! 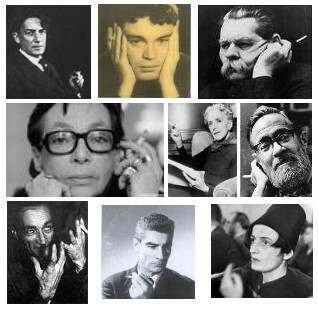 Hernández’s customary poverty and vagabondage were alleviated somewhat by his association with a circle of major Latin American intellectuals. 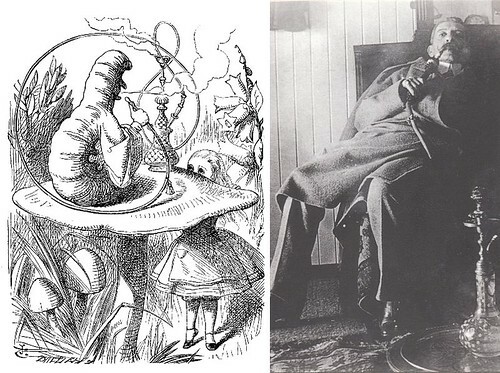 After 1940, he gave up piano-playing to devote himself to literature full-time. He traveled to France in 1946 and spent two years there, forming a close and lasting relationship with distinguished author Jules Supervielle, who presented him at the Pen Club in Paris and at a Sorbonne lecture hall. 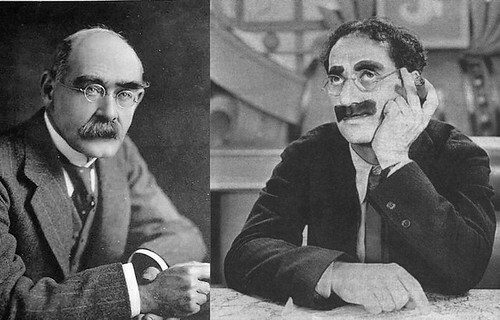 The definitive smoker chic look anticipated by Rudyard Kipling two decades before Groucho Marx perfected it with a fine Cuban cigar.